In November 2017 the first meeting of the Blended Learning SIG established by members of ASAUDIT took place in Stellenbosch. In June 2018 the group plans to come together again to report back and explore further topics of relevance to blended learning and teaching technologies in higher education in South Africa. RCCPII and ASAUDIT will be joining forces on 18 June 2018 to jointly organise the ASAUDIT Blended Learning SIG meeting. 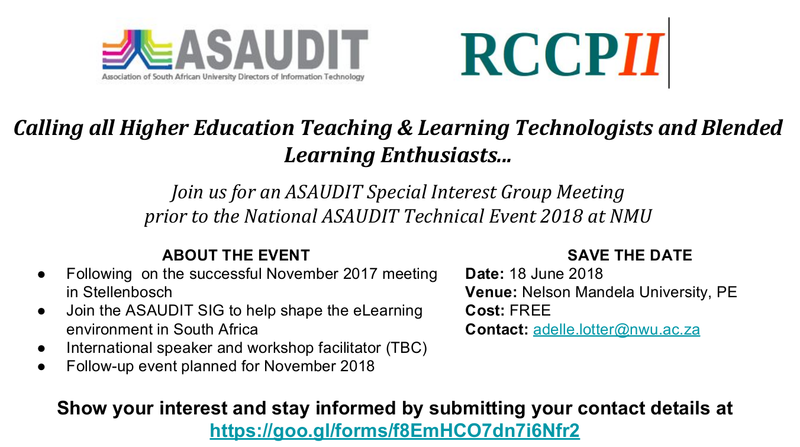 The meeting will take place just prior to the National ASAUDIT Technical Meeting (NATE 2018) at Nelson Mandela University. The programme for the event is currently under development. If you would like to be informed when registration opens or if you have any suggestions or questions for the organisers, please complete the short form available at https://goo.gl/forms/f8EmHCO7dn7i6Nfr2.